We had an excellent trek to Everest Base Camp this morning and it was so interesting to trek up the Khumbu glacial moraine and to hear the roar and sometimes witness an occasional avalanche. 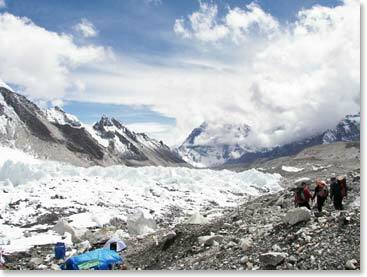 Base Camp is literally a United Nations of lots of energetic and pleasant people and the brightly coloured tents and many dozens of prayer flags are quite a sight and certainly add to the allure of being here. 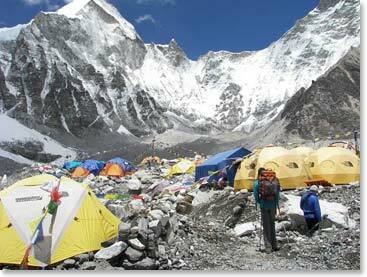 The famed Khumbu icefall is very powerful looking and I can hear water running from the melting of the glacier. The creaks and groans of the glacier sound amazing and it’s a bit surreal to be here, in the steps of Hillary, Tenzing and so many others who have summitted Everest via this base camp. The flags are printed with the image of the wind horse (lungta) which carries the prayers to the four corners of the earth. Prayer wheels are also everywhere and are spun clockwise to activate the thousands of prayers inside. I’ve thought a lot about Buddhism during the past few days, it’s more a philosophy than a religion, and the absolute goodness it inspires and seeks to achieve. As the risk of oversimplification, Buddhism, 2000 years old, advocates moderation in everything and general enlightenment and helping others, not bad goals for all of us to strive for. When I think of the 75 year old Dalai Lama, being forced to flee Tibet in 1959 and 52 years later he’s still living in exile in Dharamsala, India, it resonates and frustrates knowing the people he represents, not to speak of the philosophy, are among the most gentle, sincere and humble people in the world. Six thousand monasteries (95%) have been destroyed in Tibet and the untold damage done in Tibet has not been only at the hands of the Chinese. I was shocked to read in Michael Palin’s Himalaya that the British, in 1903, slaughtered some 3000 Tibetans under the directions of Colonel Francis Younghusband, only to exit Tibet four years later. On a lighter note, I laughed to myself today as I trekked to base camp and reflected on my various adventures. When I first decided to sign up to compete in an Ironman competition in Nice, France, knowing I would have to learn to swim to prepare for the grueling one day competition which includes a 3.8 km open water swim, a 180 km bike followed by a full 42 km marathon, my brother Cory and some friends thought I may have lost it. Cory suggested I leave him in my will! I assumed he was joking! However, it did get me thinking so I discussed the matter with my doctor, Gordon Higgins, and he rightfully reminded me that I am a descendant of iron people. How true! When I think of my grandparents and how hard they worked each and every day just to feed and clothe large families as their parents did before them and I think how tough a breed of people my ancestors were to have settled and survived in coastal NL, then the notion of competing in an Ironman or competing in an ultramarathon in Morocco or running the Everest Marathon suddenly does not seem such a formidable feat! I did learn to swim and I completed the Nice Ironman followed by another Ironman in Penticton, BC. Cory, Trish and son Quaid, my sister Valerie and future husband Dayne, my cousin Lynne and family, my niece Cindy Power and my daughter Krizia all gathered in Penticton to support me as I ran across the finish line – how cool was that! I so proud to have family there to support me. I just returned from the marathon HQ – yet another check up and doc confirms all good to go – bp 120/80. The final count is 104 marathoners. Sixty-three are foreigners including 7 Canadians, 12 Australians, 4 New Zealanders, 2 British. The Commonwealth is well represented. Long live the Queen! Apparently, the Everest marathon record, held by a Nepalese man, is 3 hr 28 min which is unfathomable to me, but it’s a fact. The average completion time for a foreigner is between 6-8hrs and some have taken as long as 12 hours. Cheers to the Big E!